For a nation renowned for its love of all things sport, it should come as no surprise this admiration and aspiration extends to what we drive. We are inside the top-10 world sales market list for Lamborghini, Porsche is seeing continuing sales growth and both Mercedes-AMG and BMW M Division speak highly of the Australian market, where we have the highest performance-version to regular-model ratio in the world. And for many buyers, who reach a point in their driving life where a mid-size executive sedan is the right car for right now, the option of spending a bit more to get the sporty one seems like a pretty simple game of connecting the dots. But let’s face it, despite having over 400 horses pounding away beneath leather and Alcantara, a day of churning up a winding ribbon of deserted, highlands tarmac is the exception rather than the rule. In fact, we’ve done just that with two of these cars before, and while a fun day was had, it wasn’t ‘everyday’. In real life, these four-door stockbrokers in sneakers need to handle being off as well as they do being on. Off, to commute, shop and ferry the kids to school. On, to handle a track day, back roads tour and, well, ferry the kids to school. Because who said the daily grind can’t be a bit of fun for everyone. So, for this comparison, we challenge three of Europe’s best mid-size sports sedans to a variety of tasks to see which one can equally manage the life you have, and the life you want. As the quintessential executive hotrod, the C63 S wants for very little beyond its $155,615 price tag. In fact, the options extend mainly to the personalisation space, with carbon trim available both inside and out, a selection of nine colours (ours is a basic, no-cost Polar White) and a couple of wheel choices. Under the bonnet is a 4.0-litre twin-turbo V8 which pumps out 375kW and 700Nm of torque. Power is driven through a seven-speed multi-clutch gearbox to the rear wheels, where there is a clever electronic locking rear differential. It’s a hefty machine, weighing in at 1783kg, giving a power-to-weight ratio of 210.3kW per tonne. Inside, there’s black Nappa leather and some nice carbon-fibre trim elements, along with a 13-speaker Burmester stereo and power everything, including the steering column. A large panoramic sunroof is also standard. While you enjoy the solar rays, you can know that running your Benz for three years will cost $3380 as part of a capped-price service package. Parked up and standing still, from the front at least, the C63 is a bit of a beast. The huge air intakes more than just a subtle hint at the car’s appetite for atmosphere consumption, but we feel it’s just a little under-done at the rear. Perhaps it’s the fact nearly every standard C-Class has an AMG pack on it, or perhaps we’ve just been a little too teased by the fatter hips and wider track of the C63 Coupe. Whatever the case, a slightly more street-rod approach to the back-half of the AMG wouldn’t go astray. That said, we like the AMG in its contrasting white with black trim, although the Brilliant Blue colour is a close second. There aren’t too many icons left on our roads, but the BMW M3, which celebrated its 30th-anniversary last year, certainly fits the bill. This is the most powerful M3 ever, with 331kW and 550Nm available from the 3.0-litre twin-turbo inline six cylinder engine. A seven-speed dual-clutch gearbox sends all this through an electronic rear differential to back wheels. It looks good for 30 too, saving 261kg over the Mercedes, bringing the power-to-weight ratio to 217.5kg per tonne. Our 2017 BMW M3 Competition lists at $144,900 (before options and on-road costs) but is fitted with BMW Individual bi-colour leather with contrast stitching (over the standard Merino leather interior) which is a $6000 option. Other additions include automated parking assistance ($675) and the anything-but-subtle BMW Individual ‘Twilight Purple’ paint ($7800). Before you fall off your chair after reading those option prices, the paint and interior combo are part of the BMW Individual bespoke program. You can choose from any colour in the BMW range, or let your imagination go full Prince, but rest assured, should you want to keep the car looking a little more subtle, the BMW staple of Alpine White is a no-cost choice. The polished face ‘style 666’ wheels and pumped arches give the M3 an aggressive and menacing stance, despite now being the oldest car here. 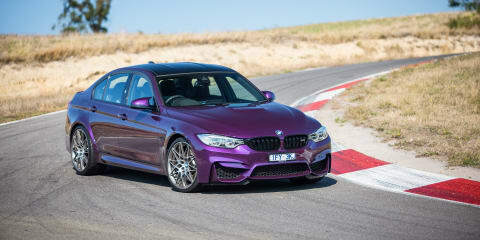 It’s strange, but the BMW can even pull off the rude-as-you-like purple paint, although we’d probably be a little bit more conservative, and perhaps add the M-Performance lower front splitter for a bit more driveway scraping cool. Despite our car’s personalisation touches, the soft leather interior, with full upper and lower dashboard trim and handbrake boot coverings is standard, as is a 16-speaker Harmon Kardon stereo and heated front seats. The carbon-fibre roof negates a sunroof, but there are cool retractable blinds in each of the rear doors. Owning your M3 over a three year period will cost $2482 through the BMW inclusive service program. Coming in at $1000 sharper than the BMW is the newest car here, the 2017 Alfa Romeo Giulia Quadrifoglio, or just QV to its friends (even if it no longer wears the ‘Verde’ in its name). Again, the car comes fully loaded in its standard $143,900 trim, with our lovely Montecarlo Blue paint (one of seven choices) adding $1690 to the total. We’ve also got $910 worth of yellow brake calipers and $650 extra for the dark-finish five-hole 19-inch alloy wheels. We can see past the ugly radome and sensor array, the plastic grille elements and even the sometimes iffy paint finish, as the Giulia QV is pure Alfa Romeo, or in other words, gorgeous. The cloverleaf badges, all the vents, that enormous rear diffuser and even the sparkling colour highlight this is a terrific looking car, awash with carbon-fibre aerodynamic extras along the front splitter, rear spoiler and side skirts. Furthermore, the bonnet and roof are both carbon-fibre, albeit painted. Leaving the hood would be a little bit much, but a clear carbon finish on the roof, like the BMW, would look excellent. Power comes from a 2.9-litre twin-turbo V6 with 375kW and 600Nm on tap. The QV uses a traditional eight-speed automatic transmission with rear drive through an active torque vectoring differential. At 1585kg, it’s about 60kg heavier than the BMW but still 200kg lighter than the AMG. That gives the Italian stallion a power to weight ratio of 236.6kW per tonne. Inside, a trim of both leather and Alcantara give the Alfa a sporting touch, and there are some nice carbon elements around the cabin too. Harmon Kardon supply the sound here as well, with a 14-speaker system. A three-year Mopar protection plan service package costs $2189, making the Alfa not only the most affordable to buy, but also to run. That said, most major brands, including the three featured here, support a corporate VIP program, where service costs (usually for three or four years) are discounted or even free. You’ll need to check with your employer to see if you qualify though. So ignoring the options on our cars, which aside from the carbon brakes on the AMG, are entirely style related, we have an $11,715 range in pricing. On the face of it, that is not insignificant, but looking at a basic finance calculation, based on a 36-month term with 40 per cent residual and six per cent interest rate, things get a little bit closer. Monthly repayments here range from $3152 on the C63 to $2795 on the Giulia, the gap between the two equating to about $11 extra per day, or at CBD prices, a toasted sandwich for lunch. And while all this makes you and I nod in agreement with the sensible maths, (especially the part where I don’t have to say this isn’t financial advice), it’s clear buyers aren’t too fussed by the boring fiduciary details, as the most expensive car, the Mercedes, is the clear sales leader. The C63 outsells the M3 by a factor of about 60 per cent, but both models are in hot demand, accounting for roughly 12 per cent of their ‘family’ sales alone. That means one in every eight C-Class or 3 Series sedans sold was a C63 or M3. Will the QV account for that volume of Giulia sales? Only time will tell. Listen and compare the Bluetooth audio quality below. Subscribe or download the CarAdvice podcast here. Before we turn the keys on over 1000kW of multi-turbo entertainment, and now we know what we are dealing with, just how practical are these machines as daily transport? For the most part, the M3 feels like a very nicely-equipped 3 Series, and that isn’t a bad thing. The 8.8-inch LCD screen on the top of the dashboard runs iDrive version 5, which offers a slightly more intuitive menu design and updated user interface. There is excellent live traffic data and a three-year subscription to BMW’s ConnectedDrive communication and telemetry platform. It’s a very easy system to use, pairing a Bluetooth phone is simple and the call clarity good when connected. There is no support for device projection though, which for me personally, is no big deal given the strength of the native software. The front seats are comfortable, supportive and easy to adjust, and the BMW steering wheel excellent to hold. A lane departure and correction system is standard but there is no adaptive cruise control or ‘proper’ autonomous emergency braking function. Rear passengers have a well-padded seat base but no fold-down armrest. There are vents on the back of the centre console, as well as a 12-volt outlet but no USB point or map pockets (thanks to those tickle-holes on the sports seats). With the driver’s seat in my position, I was able to fit quite easily in the back, although I found myself leaning toward the center (where you really miss the armrest) to stop my hair from rubbing on the roof. The boot is 480 litres, with a couple of cubbies and minor under floor storage. There is no spare tyre, just an inflator, and the rear seats can fold 60:40 should you want to hurry home from IKEA with a flat-pack side table. In terms of standing still then, it’s comfortable, and quite practical. Adding well-equipped to the mix, is the C63. Here the boot might be a shade smaller, at 435 litres (still with just an inflator and no spare), but the rear seats can fold 40:20:40 for added flexibility. The rear bench isn’t as deep as in the BMW, but there is an armrest, digital temperature controls for the air vents and a 12-volt outlet. The doors have bottle holders, but the front sports seats mean there are no map nets for rear passengers to store, well, maps… or given this is an AMG, perhaps a sickie bag. Passenger space is good, perhaps a little tighter to the knees than the BMW, but the large sunroof gives a good sense of spaciousness thanks to the extra light. Up front, the seats are firm, but you can position them in a good driving position with three memory points. The COMAND infotainment control hood and wheel can be a bit awkward to use on the move, plus, as in all Australian market Mercedes cars, the functions are still set up to suit left-hand drive. It’s a small point though, as once you are used to it, the 8.0-inch LCD screen is simple to use (although not quite as intuitive as iDrive). Handily, the system now also supports Apple Carplay and Android Auto projections from one of the pair of USB points in the center console. The handy equipment doesn’t stop there either, as the Mercedes is fitted with the full suite of driver assistance technology, including adaptive cruise control, lane keeping assistant, pre-collision warning and braking, and blind-spot detection. The finish and material choice is typically high grade, especially the carpets, but the leather on the dash top isn’t as soft as you find in the BMW. The Giulia by contrast is a bit of a mixed bag. The driver’s seat and overall driving position is excellent. It’s comfortable, low and has just the right amount of sportiness about it. There is nice use of carbon-fibre trim and the panel which hides the integrated 8.0-inch media screen is a much more cohesive design than the stuck-on-iPad in the AMG. But the switchgear feels a little light and cheap (one of our powered seat adjustment switches broke off), and the lid to the storage cubby between the seats occasionally wobbles and sticks. Some materials, like the stitched leather dash top, are great where some, like the plastic trim around the doors, just aren’t. The shifter, a key touch point in a car like this, is very plain and somewhat uninspiring. Even the media interface is a bit hot and cold. You’ve got a rotary dial like the BMW iDrive, but the menus are not as cleanly laid out, nor as easy to navigate. As an example, when looking at the map, you have to click on the menu, scroll to zoom, select the function, and then use the wheel to pan in and out of a limited range. In the Mercedes and BMW, you move the wheel and the system knows what you are trying to do. We had a couple of glitches with the speed and response of the system too, mainly when choosing audio sources. There’s no DAB radio (although, that is coming to all cars shortly), and if you have your lights on during the day the screen dims to a point where it’s almost impossible to read, plus the panel it resides in has a polarised finish, meaning if you wear sunglasses when you drive you can’t see it at all! But these quibbles are, for want of a better term, typically Alfa. I mentioned the polarised screen to a friend who said he’d just buy a second set of sunglasses, without polarised lenses, just to use while driving. Touche. Problem solved. The boot here is the same as the BMW, at 480 litres, and like the Germans, offers just a tyre inflator rather than a spare. There are no extra cubbies or nooks, nor is there an ability to fold the seat, or even a basic ski port, should you be caught having to transport something a bit longer or more awkward. This nearly-but-not-quite approach extends to the back seat where there is no central armrest, and the least amount of knee and toe room. That said, the Alfa is the only car brave enough to commit to the fact there’s only really room in the back for two people. Both the BMW and Mercedes have five seatbelts, but we’d never want to draw the short straw and have to sit in the middle. You do score a USB point and air vents on the back of the centre console and map pockets on the seats, but the bottle bins in the doors are quite small, making it hard to actually get a bottle in there. Listen and compare the sound of the all-important door thunks. Subscribe or download the CarAdvice podcast here. But enough about seats and stitching and door thunks, how do these machines perform? Black and white. Yin and Yang. Kirk and Picard. You can’t have ‘ON’ without ‘OFF’. Before you unleash over 350kW of rear-drive mayhem on a race track, you have to get there. Driving each of these machines in a slow, urban environment and on a country cruise can tell us a great deal about how these cars are to live with. The Mercedes, with its regular C-Class appeal, is simple enough to motor about in its most relaxed Comfort drive mode. The ride here though, as it is with the seats, is a little firm. The seven-speed MCT Speedshift gearbox is smooth enough when changing up gears, but can sometimes shudder to a stop, as it quickly changes down ratios. Some of this improves over time as the car learns your driving style and adapts gear changes to suit. Considering it has the same column-mounted shifter as a regular C-Class, Mercedes owners stepping up to the C63 will immediately feel at home. More of an issue though is the lazy response off the mark when the idle-stop system has activated. There is a definite lag between action and reaction, and even with the system left to its own devices, our fuel use for the week of combined testing was 13.2L/100km which is much higher than the claimed 8.6L/100km. For the sake of a few extra litres, we would recommend turning idle-stop off, if only to preserve that green-light wake up response. You can even configure this through the Individual drive mode (one of 5 – Comfort, Sport, Sport Plus and Race), which gives you the opportunity to make the car feel like yours, through throttle input, steering and suspension settings. As noted, the comfort suspension isn’t exactly comfortable, but at the same time can make the car float a little bit after hitting larger bumps or edges. If anything, the middling Sport setting is a nice compromise between composure and comfort. What’s more, the AMG is the only car that allows you to activate the sports exhaust, outside of the specific performance driving mode. This lets you sound like a hooligan even when pottering about, which is an undeniable part of the car’s appeal. The road loop offered a chance to use the sportiest road-driving modes of each car while dealing with real-life surface changes and the occasional oncoming semi-trailer. On a touring drive, there is a lot of noise translated through the tyres into the cabin, which on coarse chip surfaces are loud enough to drown out the exhaust. Almost. Out on the open road, the AMG builds up speed so very, very quickly, especially when given some longer stretches of road and some linked, flowing bends. There is a sense the car has everything under control, whether a good thing or not, which makes the Mercedes a very relaxed proposition, even when stepping up to low triple figure speeds. An empty road is a friend of the M3 too, the lovely fat-sausage steering wheel and ergonomic paddle placement making the connection between driver and car an easy one to manage. Make no mistake, there is power galore here, and to a point, almost too much should you start to let the BMW off the leash. Impressively too, it was the most economical on test, returning 12.7L/100km after a week of Purple Rain, against a wholly ambitious claim of 8.8L/100km. Wind it back though and the M3 is a very diligent tourer, balanced and composed, fast and efficient. It’s a great fun car, but misses an entertaining soundtrack, which only comes into effect when really pushing the tacho to the 8000rpm peak. Frustratingly, the M3 sounds the best under its cold-start tune when firing it up first thing in the morning. Dear BMW, make M3 cold-start noise the M3 all the time noise, please! Get back to the urban sprawl, and try to wind things back further again… only to realise that you can’t. Drive Barney the lovable dinosaur through your local burg, and there’s no way to un-M the M3. Comfort mode isn’t comfortable, and slow speeds are a drag with the MDCT gearbox. Don’t even get me started on parking. It’s a pity, as the customisable settings, to call upon from the M1 and M2 preset buttons on the wheel, give you a huge amount of personalisation of performance and behaviour, except a comfy comfort setting. Even with everything off, the ride is quite harsh, and the pedal feels twitchy. It’s not really a relaxing car to drive, as, well, there’s a regular 3 Series for that. If you want your sports sedan to be comfortable around town, the Giulia is a relative revelation. With the Alfa, turning it off means it will be off. That eight-speed automatic is smooth and entirely manageable, and almost like driving a regular car. The ride too is sporty, but comfortable and compliant, all while translating excellent feel through the supremely light steering. There are four modes to the Alfa’s driving setup: Race, Dynamic, Natural and All Weather. At least, that’s what we think they stand for, as it just says ‘DNA’ on the dial. Leaving Race for a moment, in anything but the Dynamic setting, the Alfa feels quite soft and spongy. The response is there, but it’s all very relaxed and easy and comfy. You can activate the adaptive dampers to stiffen the ride up, but there is no independent exhaust button, which is a real pity for those of us who just like to pop to the shops, while sounding like a screaming race car. Head out of town and turn it up a notch to the Dynamic setting, and above 4000rpm, you’d swear this was a different car. Throttle response is crisp, the sound fantastic and wow is it fast! Fuel consumption was between the others, 13.2L/100km, again unsurprisingly up on a very ambitious claim of 8.2L/100km. There’s an element of excitement to the Alfa that is less prevalent in the German cars, especially the Mercedes. You get the feeling you are driving the car. The multitude of technical wizardry the AMG and BMW use to help provide a more efficient experience are either imperceptible or just plain absent. Running the Alfa on the same high-speed country loop as the other cars somehow felt closer to the ragged edge. It’s not relaxing to drive, but in a good way. In an Italian way. Think of it as doing five rounds with an Italian temptress, and I’m not talking about boxing. When your time comes to an end, you need a stiff drink and a cold shower, and in a way, so too does the Alfa. Each time at our changeover location, the QV sits ticking, expelling heat. Like an athlete who smokes, it has the ability but does it have the stamina? Time to turn things up to eleven! To test the cars in a performance environment, we headed to the 1.3-kilometre Haunted Hills hillclimb track in Gippsland, about 90 minutes from Melbourne. This twisting short course has elevation changes of about 200m and gives a good simulation of a tight mountain pass, without having to worry about oncoming traffic. Each car was put through an out lap, two hot laps and then a cool down, a short, five-minute break, and then another identical session. This process allowed tyres and brakes to come up to optimum operational temperatures while ensuring the runs for all three cars were as identical as possible. All cars were running on their placard-defined tyre pressures and the outside temperature was around 20-degrees. First out was the C63. Switching the Mercedes to Race mode still maintains a level of traction control, which seeks to just cut power when the rear tyres start to lose traction. For a modest driver, this gives you the ability to push the car quite hard, while still retaining a safety net when powering out of tighter bends. Even with this activated though, the car still moves around through bends and under brakes. There’s plenty of gurgling and cracking from the exhaust when you back off the throttle to keep you grinning too, the AMG an entertaining machine at all times. For our lap time, our resident track hack, Dave Zalstein, had traction control disengaged to minimise the power cuts, leaving him to instead modulate the throttle himself. While much faster around the track like this, the shorter straights and undulating terrain of the Haunted Hills circuit still challenged the level of grip achieved by the AMG, especially under heavy acceleration. The big, torquey engine struggling at times to get all that power down. Get some traction though and it will hold grip through the bends with ease. It’s an easy car to drive fast, with third gear proving a favourite, exhibiting next to no lag, thanks to the wide 1750-4500rpm torque band. Those carbon brakes felt good, but having driven a C63 on the standard steel rotors, stopping, on a shorter run like ours, has never been a problem. What the carbon discs allow is a repeatable time. Lap after lap after lap, all day, everyday. In reality, they were never really going to come into play on our 10-odd times around the circuit. Rubber wise, the Michelin Pilot Super Sport tyres felt good during both sessions, with the faster lap time coming on the second run out, once there was some heat in them. That said, the extra bulk of the C63 was noticeable, and no doubt played a part in its third placing lap time of 1:04.57. For the BMW, we opted to set up the M-Drive mode to the full Sport Plus setting, with the dynamic differential and traction control program set to off. Again, with this set to the dynamic ‘MDM’ level, there is a traction control angel watching over your corner-exit shenanigans. The M3 will allow a little more rear angle and tyre slip than the AMG, before limiting power and helping you line things back up again. It’s not idiot-proof mind you, get your weight balance wrong and try to be too much of a hero, and the lovable Grimace will quickly become the purple people eater, especially as it snaps quickly if you simply jump off the gas. Bottom line, you need to concentrate on the task at hand. Find your zen connection with the BMW though, and it is an exceptionally fun machine that will challenge you to push just that little bit outside your comfort zone. It runs the same Michelin Pilot Super Sport tyres as the Mercedes, which held up well and provided excellent grip. Again, turbo lag is largely a thing of the past, with a wide torque band between 1850-5500rpm giving exceptional response when you nail the throttle. It does feel faster than the AMG, with a perceptibly higher G-force loading through Haunted Hills’ tight uphill corner complex. The feeling is translated to the clock, with the M3 producing a very sharp 1:03:00 flat. So, with gauntlet thrown down, and a target time set, how would the Alfa perform? Here, there is no middle ground. There’s no traction program or clever differential setting to play with. Switch the Giulia to Race mode, and that is what you get. Traction off, forward collision detection off, exhaust on, overboost activated. Deep breath. It sounds delicious too, the V6 singing a very Italian tune, with requisite loud pops on upshift. The light steering of the Giulia makes it feel as though it weighs less than the BMW, which is a good thing as you need to work on the wheel all the time. Again there is a wide slab of torque on tap from 2500-5000rpm, but it tends to wiggle around much more than the Germans, the throttle position having a much more significant part to play in the overall behaviour of the car. In the Race setting, the tail of the Alfa will push very easily on corner exit, requiring a good amount of self-control, mated to a sense of self-preservation when trying to move the QV at a very brisk pace. And it is brisk. Ho boy. The multi-clutch transmissions of the German pair may be more technically advanced and faster to change, but the basic automatic in the Giulia is no slouch, and the giant banana-sized paddles easy to reach. The movement feels quite comparatively long too, somehow masking the slower shift but increasing the tactile enjoyment of every change. Banging back down through the gears is a particular aural delight too. It really is great fun. Sadly though, the Alfa was let down by its rolling stock, the Pirelli P-Zero Corsa rubber providing more grip, and a faster time, in the first session than the second. The higher temperature reducing grip and pace enough to force the QV to understeer through the right-handed crest at the top of the circuit. The brakes too, seeming to fade after only a couple of laps of enthusiastic use. Planning to track your QV on a regular basis? Stump up for the extra $13,000 carbon-ceramic brake package, and maybe get some new rubber. It was still fast, though. Very fast. The Alfa logging a time of 1:03.44, less than half-a-second off the pace of the BMW and more than a full second in front of the AMG. The placement of the BMW and Mercedes didn’t surprise us, the shorter track not really playing to the favour of the Merc, and the countless hours spent by M Division engineers to perfectly hone the M3 over the years making the result almost inevitable. But to see just how close the Giulia came to a lap-time victory, and considering better tyres and brakes would have made a huge difference, it is an impressive result indeed. Listen and compare the sound of the exhausts. Listen and compare the 0-100km/h sprint below. Subscribe or download the CarAdvice podcast here. So here we have a bit of a quandary. The 2017 Alfa Romeo Giulia QV is the most affordable car here. It is properly quick and gave the BMW M3, a car which has just clocked over 30 years of cumulative product experience, a run for its money around a track. It is cool, comfy and equally at home in town as it is on a faster run. But then the 2017 BMW M3 Competition is only $1000 more to buy, is lighter, faster and more technically adept around a circuit. It has a great interior, the best infotainment and feels so much more resolved as a car than the Alfa. And finally, the 2017 Mercedes-AMG C63 S, which despite being heavier and more expensive, outsells everything else. It has plenty of power, usability and accessibility and really rounds out the ‘there are no bad cars here’ statement. Hence the ratings, which show the same 8.5 score for each car, albeit in differing areas. And that’s the crucial thing. We weren’t looking for the fastest on a track, not the quickest in a straight line, we wanted to find the best ‘do it all’ and ‘do it well’ sports sedan on the market. So the car we recommend for that role, is the Mercedes-AMG C63 S.
It might not have the character of the M3 or the passion of the Alfa, but as a capable all-rounder the C63 is pretty hard to fault. Powerful and accessible, with all the technology and usability of its regular brethren, the C63 isn’t the favoured executive hotrod for nothing. The BMW M3 is never ‘not’ an M3, which is probably why it would be my personal choice of the three, but is also why it couldn’t take the prize. Comfort should mean comfort and not just ‘less sporty’. Living with the BMW is never a Jekyll and Hyde experience, it’s Hyde all the time, just ranging somewhere between not enough and too much coffee. 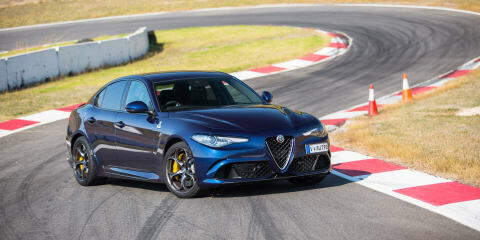 And the Alfa Romeo Giulia QV? While it may be cramped in the back, and isn’t on the same level in terms of infotainment, and just lacks that little bit of polish, if our measurement was a bell curve of ability between driving OFF and driving ON, then the AMG might be the area under the curve, but the Alfa has the outlier roles well and truly in hand. It is plenty quick and has the most diametrically opposed nature between its comfort and sport modes. It’s not perfect, but it is fun, and brings the Italian brand back into the thick of things in the performance sedan stakes. Click on the Photos tab above for more images by Tom Fraser.